Oh, scraps. We love 'em. We hate 'em. Lately I've been embracing the scrap in my 10-Minute-Scrap-Pile Challenge, so this challenge from Nichole for the senior Design Team (and me! as the Guest Designer) at Papertrey Ink could not be more perfect! This little cutie may not be a 10 minute card, but it is a much faster project than you might guess. The secret to the Patchwork Scrapwork (catchy, isn't it?) is super simple, super easy. Scout's honor. First up, gather a few scraps. I went for a mix of patterns and materials. 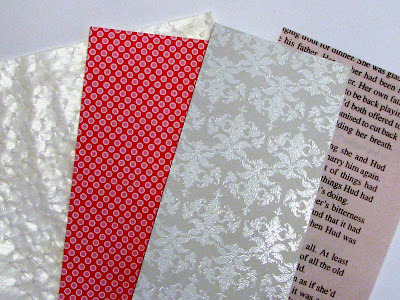 From the left I have a dry embossed glassine bag scrap (left over from a Paper Crafts project), a scrap of Simple Valentine patterned paper (left over from some valentines), a stamped and heat embossed scrap (yes, white embossing on Soft Stone again... in the words of Rachel Zoe... I die), and a scrap of vintage bookprint (leftover from my Christmas cards). I kept to a somewhat monotone palette with just a pop of color, although I have also had success with this technique using all bright colors, shades of similar colors, etc. I really think it can work with whatever you like... just keep mixing it up until you like the patterns and colors together. I went with a standard A2 size card and then decided that I wanted the patchwork panel to fill up most of the front. I cut a piece of scrap white cardstock to use as the base for my patchwork strips that was a bit bigger than the size I'll eventually end up with on my card. There's no science to it... just plan to fill up a piece of scrap paper that's bigger than the space you eventually want to fill. Then, trim each scrap into several strips of varying widths. You're aiming for randomness. That sounds a bit contradictory, doesn't it? I just cut a strip or two of each, then start laying them out on my paper base. I like to arrange them so that I break the A, B, C, A, B, C pattern. I think it helps the randomness in the next step. Glue them all down to your prepared base. Just take your nifty panel of paper strips and trim it down into strips of random sizes. This time, you're trimming the strips so that each strip consists of a little bit of each of the papers you used to make up the panel. On the above pic, that would mean trimming the panel down from left to right. Then, take your new strips and lay them down onto the panel that you want to use on your card. It looked a lot better after I neatened the edges up with my trimmer. See? I love how it looks like I trimmed out and glued down each patch piece by piece! Yeah, I totally didn't. Now, it probably took me waaaay longer to type all of that out than it will for you to make your patchwork panel. I swear. I really wanted to keep the focus on the patchwork, so here's how I finished my card out... I started with a card base made out of Guide Lines I cardstock... thought that would be a fun way to emphasize the patchwork pattern. 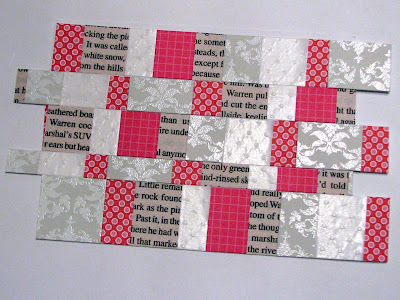 I added a mat for the patchwork made from white cardstock and glittered the edges for an extra detail. I backstitched along the bottom layer of patchwork with some pink embroidery floss and then added the stamped sentiment above it with a bit of foam tape. I love how adding that little heart in the middle of the sentiment looks! I'm totally digging the patchwork scrapwork! 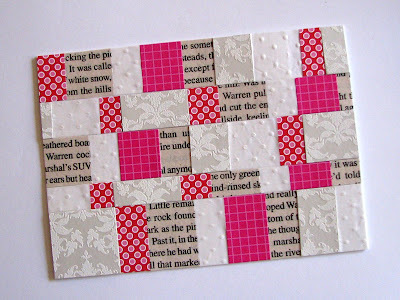 It's a simple way to use up all those extra patterned paper or cardstock strips and make them into something super cute! One other thing I *love* doing with this technique is to just use one or two strips on a card along with a simple sentiment. You get lots of bang for your buck on that one as you can complete lots of cards with just one patchwork panel. 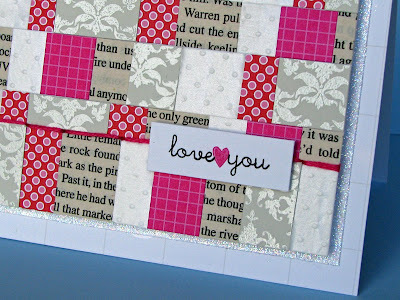 I'd *love* to see your patchwork scrapwork card! Be sure to come back and leave me a link if you post your own patchwork card! Betsy Veldman Michelle Wooderson Lisa Johnson Heather Nichols Becky Oehlers And, if you'd like to see more of what I (try) to do with scraps, and try your hand at your own, come back on Mondays! I'll show you a card that I've (attempted) to complete in 10 minutes with the scraps from my personal scrap pile. It's always fun to see what the frenzy of 10 minutes brings me. Great way to use a LOT of scraps all at once! What a great idea Jess! Fantastic use of scraps, the randomness is fab! Super cute and such gorgeous colours! This is absolutely wonderful -- thanks so much for taking the time to give us such clear directions. I'm looking forward to giving this a try! Stunning card! This is a great way to use up some scraps! Wow! Absolutely fantastic idea and the result is gorgeous. I've made a few quilts using this technique, what a good idea to transfer it to paper! I may have to give it a go, thanks for the inspiration. Happy New Year! What an amazing innovative card - depending on the colourways this could be used for so many different occasions. Wow Jessica totally love this! woo hoo! What a great idea! LOVE THIS IDEA! 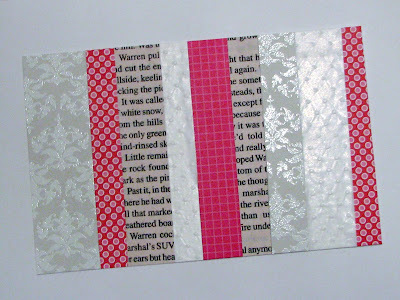 You are so right, how nice to just do one strip with a sentiment or even a series of gift tags to give as gifts! THANKS for great inspiration! Happy New Year, friend! 22 whole days 'til we meet again. What fun to create those stripes! Terrific use of scraps! Love the mixture of colors. 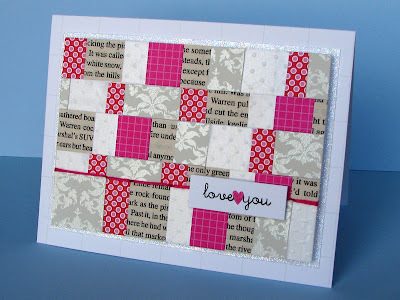 thanks for the great directions...love this patchwork look and your card is awesome! Stop it!!!!!!! OK hellooooo----I am dieing over here. Love it! Going to covet it! That is clever, Jessica and I just love how your mix turned out. Hi Jess! Patchwork galore! I made 6 cards for my mom using this technique. A great idea! Thanks for sharing it. Happy New Year to you and your family. Love your quilted look. Terrific ideas! http://www.splitcoaststampers.com/gallery/showgallery.php?cat=500&ppuser=54876 I'm addicted to this technique. Hope I linked this ok. Thanks for the inspiration! What a neat idea. When I first looked I totally thought you cut out each individual piece. I will be testing this out soon. Great card. I finally got around to posting my "scrapwork" project! Thanks again for the awesome technique!